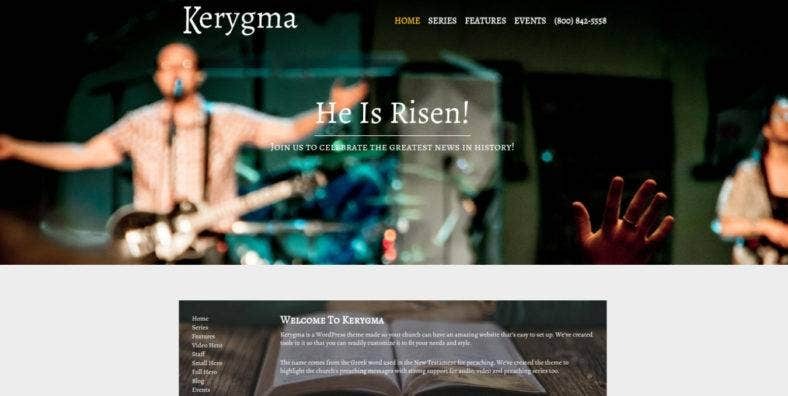 With many organizations and businesses building online portals on the World Wide Web, churches and religious groups are also trying to keep up with the trend by creating their own websites. A church website is an essential means to keep the community or religious organization together, especially in our ever-advancing environment. 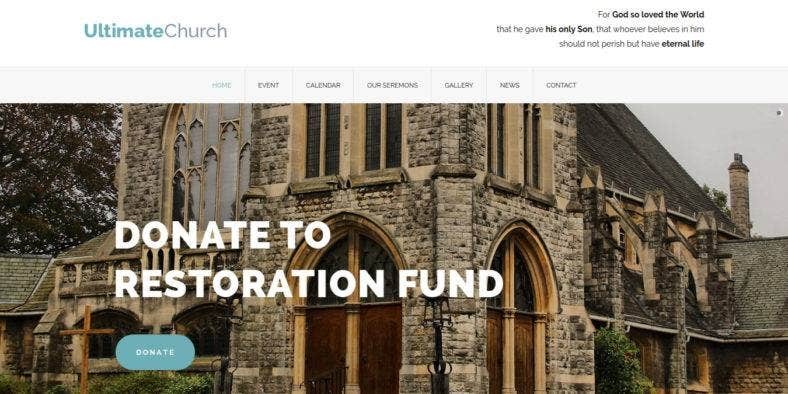 Spiritual and nonprofit, church websites tend to be more informative as they generally provide details on services and programs to the group of people they are serving. Additionally, they can be a great tool to share messages, collect donations, and study the Bible or Quran online. 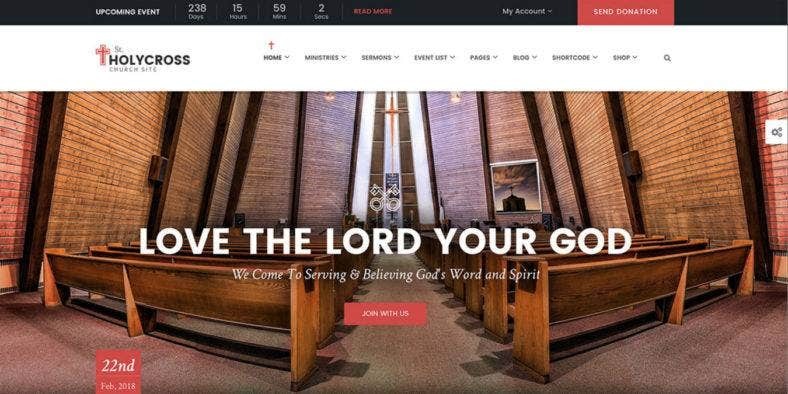 So, here are some of the top church WordPress themes and templates that you can use for your churches, religious organizations, parishes, ministries, and spiritual groups. 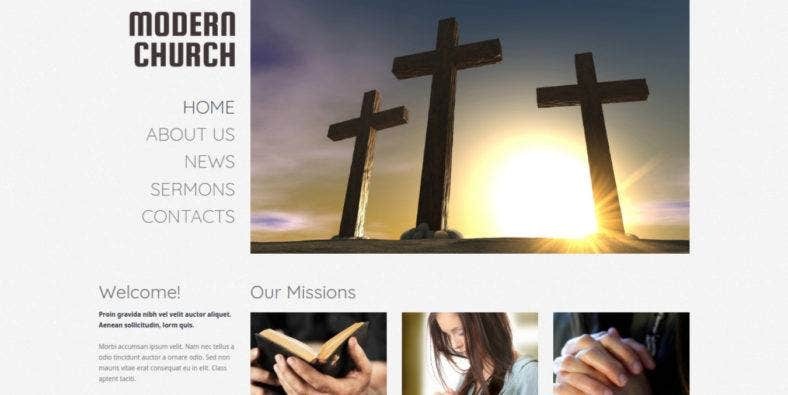 New, modern, and responsive, these themes will surely provide you with a flexible and functional website so you can keep your members informed about upcoming events, donation options, church services, and other important news as well as providing them regular messages and teachings from your beliefs. This collection is composed of various templates for different religions and sects. Check out these web design tools below and find exactly what you need. First of all, we have this modern and elegant WordPress template built especially for churches. Christian Church presents a state-of-the-art design with a one-page layout and parallax effect for a stunning visual appeal. A great and well-designed online source for religious information, it is also as functional with many useful features that you need included in the template. Among its many attributes are the cross-browser compatible and mobile friendly interface, custom admin panel, Bootstrap functionality, audio player and video integration, several sliders to choose from, and well-organized archives among others. Instead of a standard header, it presents a vertical menu at the center while the main navigation panel comes after. Secondly, we have Creed. 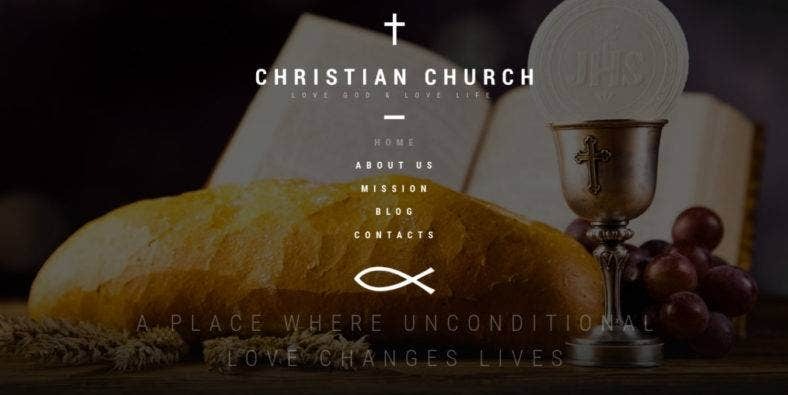 A beautiful church website template for WordPress with a striking imagery that will surely catch your visitor’s attention and interest. It can also be used as a religious and clerical website theme for non-profit organizations, prayer groups, religion communities, and such. It comes with multiple demos for different types of purposes. A perfect tool to spread spiritual messages that touch the souls and lives of people, this templates comes with features for sermons, special events, videos, images, and maps with custom specific icons, buttons, CTAs as well as a blogging section. Other features include a diversity of slider, unlimited color options, a Visual Page Builder, and more dedicated pages. You may have a heard of the popular magazine, Kerygma. Well, this church website theme might be inspired the religious manuscript as they both offer the same content. Yet, with this template, you will be able to spread your messages through different types of post formats, such as audio and video podcasts along with integrated message links and speaker archives. 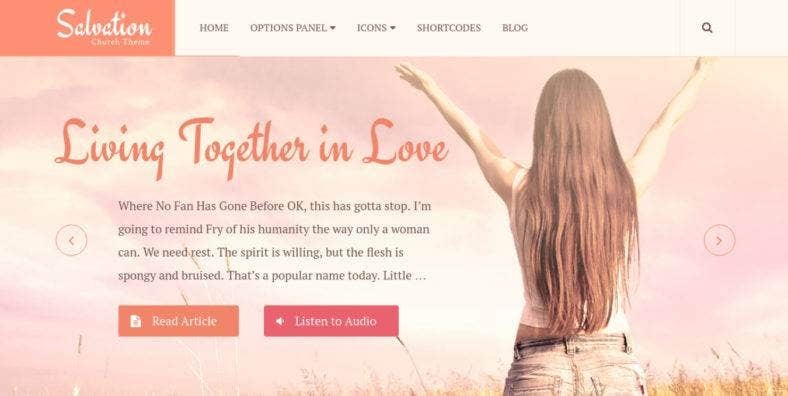 We also have on this list a perfect WordPress theme for Buddhist websites to provide individuals an online resource to practice their faith and spirituality in the Buddhist way. Featuring a fully responsive design that is also fully editable, you will be able to customize the theme, BuddhismI, according to your desire and your website’s needs. Among the other features that this theme has are the 80+ shortcodes to help you build pages effortlessly, various custom post types and formats, multiple color options, customizable typography with over 600 Google Web Fonts, standard widgets, a filterable portfolio, and some fantastic sliders. All these are manageable with the theme’s built-in Theme Customizer. Evangelist is another church WordPress template that comes with a warm look over a simple yet modern layout. With a high quality design, the theme also boasts of its customization abilities and easew in usability. It allows you to modify its colors, backgrounds, layouts, ad others effortlesly just by clicking on the powerful WordPress admin panel. Its customization options include the events calendar slider which is combined with a regular image slider, another built-in calendar for sermons, easy-to-post gospel resources, various backgrounds to choose from, and a bunch of page templates that you can use. It is also fully responsive and retina ready so, it is guaranteed to look good on all devices. 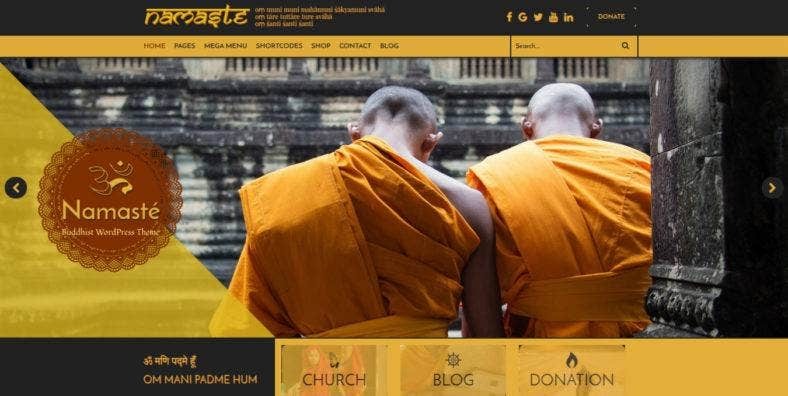 Another spiritual WordPress template is Namaste, which is created, especially for Buddhist churches and organizations with their religion, Buddhism, in mind. This premium website theme comes with a superior collection of features and options that help you create an impressive online web portal which allows you to display different kinds of content. Its key features include six post formats, portfolio and event modules, tons of unique shortcodes for posts, events, portfolio, price table, and other sections. All these are managed through a user- friendly options area and page builder from Unyson. With the use of this framework, you can import and install all of the demo content in just one click. 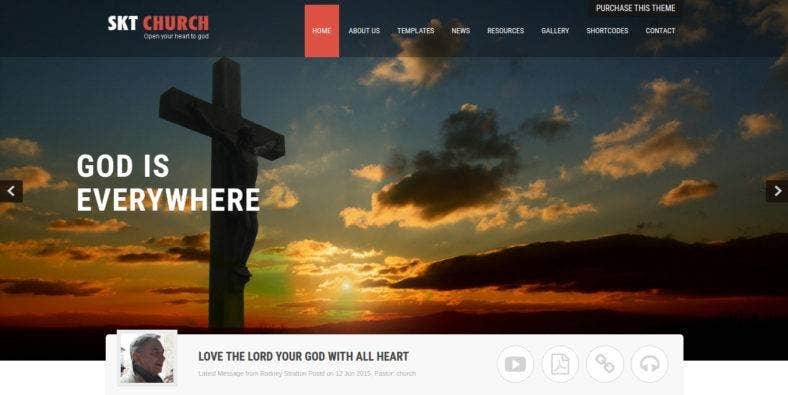 As indicated in its name, the WordPress template for churches you see above has a modern design characterized by a clean design and unique layout. While most templates have their title and menu at the topof the page, Modern Church incorporates a title section and menu bar at the side of the page, while the content is arranged on the other side with a much wider space. Moreover, it features a fully editable design with custom post types and formats, multiple color options, filterable portfolio, custom widgets and typography, fantastic sliders, and other design elements. All these can be modified and personalized through the built-in Theme Customizer, while the whole template can be set through a two-step installation process. 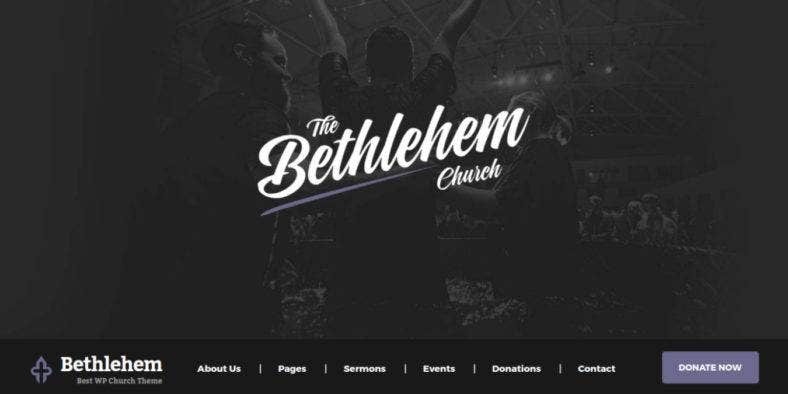 Bethlehem, on the other hand, is a modern WordPress template for every and any equally modern churches and religious organizations. With a fullscreen image header and a one-page parallax layout, this is one of those awesome templates that is intuitive in deisgn, flexible in customizability, and powerful in functionality. A personal favorite because of the premium features included in the theme, namely Slider Revolution, Visual Composer, PSD Design, and the WordPress platform used to build the theme from scratch. Other features include 8 header styles, ultimate saver tools like the Events Manager, WooCommerce plugin, GIveWp for donations, and so much more. Kingdom Church is a unique WordPress template for churches and religious organizations to use. It presents a number of modern and trendy features, such as an animated fullscreen background and a minimalist layout. This religious website template also comes with many customization options which make it flexible and versatile. Among its many features is the WordPress Live Customizer that allows you to upload your own logo, modify the colors, change background images, and more in order to create just the right website that is your own. With the Church Theme Content plugin support, it also enables you to add sermons, events, location, leader and staff profiles, and so on. 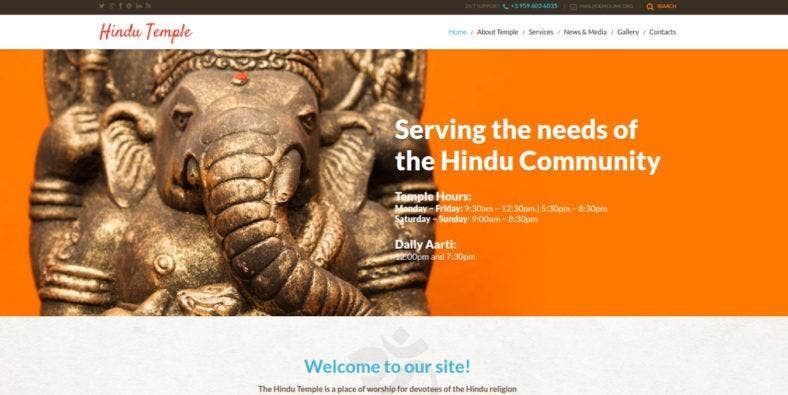 Another religion WordPress theme is Hindu Temple, which is obviously built for Hindu websites that are used to serve the world’s different Hindu communities. With a clean and simple design integrated with motifs reminiscent of the Hindu culture, this theme allows you to publish articles and content related to the religion and its practices. Its list of features and options are composed of advanced Theme Options, Back to Top button, a calendar, a commenting system, custom page templates, drop-down menu, Favicon, Google map, Google Web Fonts, sample content, social options, sortable gallery, tabs, tag cloud, tooltips, and others. It is also fully responsive and cross-browser compatible. This highly efficient and professional theme is responisve, fast, and great for chuch websites as it comes with functional donation, sermons, and events systems. HolyCross Church comes with many options which includes 3 homepage layouts, 16 blog layouts, 2 header layouts, and lots of shortcodes to use and build your website upon. It also includes a wide array of unique and standard features that will help make your website functional and dynamic. Among these are a number of ready-to-use sections, useful blocks, various PSD files, essential pages and other beautiful elements. All these are customizable for you to create the perfect website that suits your need and leaves a strong impression. Church Plant is a gorgeous church theme from WordPress that is designed and developed for brand new churches. No matter the size of the church, this theme’s features can surely cover all of your church or religious organization’s needs. The template is also made responsive and mobile-ready without comprising the flow of design and its aesthetic. Its modern and state-of-the-art design, as well as its clean and simple layout, will surely set your church website apart from the rest, making more people more interested in your ministry. Take advantage of its countless customizable options, countless add-on features and innovative plugins to create a website that suits your taste and preference. 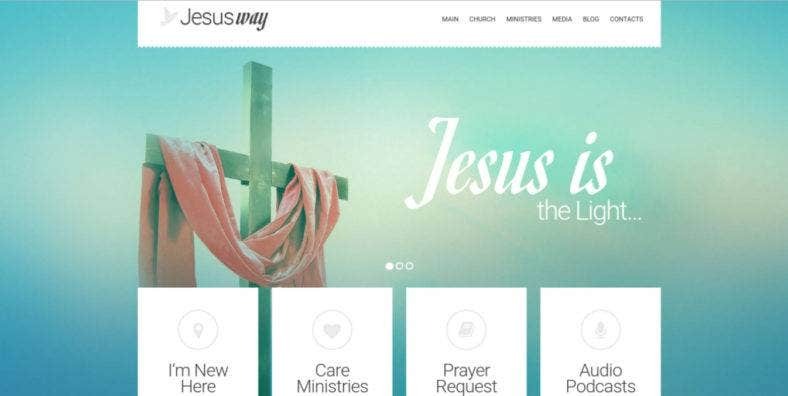 With an easy-to-the-eyes color scheme, minimal design, and simple layout; Jesus Way is quite the appropriate theme to present church services and share spiritual messages. Moreover, the theme is also easy to use and helps you provide a great user experience to your visitors with its simple interface, along with is responsive and mobile-friendly layout. This clean and simple WordPress theme also comes with many features like the 2-step installation process, multiple color options, custom widgets, editable typography, awesome sliders, filterable portfolio, and so much more. Also, with its inherent Theme Customizer, you are able to customize these elements to fit your taste and preference. The clean and minimal WordPress template you see above is Ultimate Church, another church website theme featured on this list. It’s modern and professional, which means you can also use it as an event website or conference page template. So, it includes three versions of its homepage for you to choose the most appropriate look for your website. Other features included in the theme is its powerful ThemeWaves page builder which is integrated with over 30 shortcode-based elements, different custom post types, a layered slider, hundreds of Google Fonts and icons, and so much more. With an extensive Theme Options and super clean and organized PSD file, this theme boasts of an easily editable content. Another modern yet simple WordPress template for churches is Growing Church. Responsive and mobile-ready, this theme includes unique and special functionalities that every church website needs. It features a Sermons, Recurring Events, Staff pages among others, together with other customization options to help build the perfect website that you want. The theme includes various color pickers, easy font controls, flexible layouts, event managers, a contact form, parallax effect, built-in background choices, integrated Google maps, Instagram feed, and so much more. All these are responsive can works well with any type of device with different screen sizes. Ideal for both professional web developers and amateur website owners. For Islam churches or mosques, as they call it, here is a responsive WordPress template drafted and built for Islamic centers and community websites. 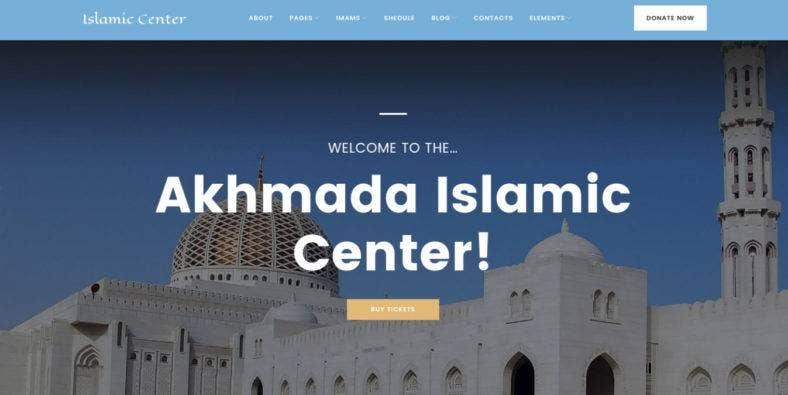 Built with Power, a drag-and-drop and flexible page builder, this theme allows you to take control of your website and build pages to provide Islam teachings and other content easily, along with a fully responsive layout. Akhmada comes with more than 25 content modules, a library of presets with a drag-and-drop functionality, an advanced set of configuration options, a collection of Cherry plugins, multiple layout variations, 7 header layouts to choose from, custom widgets and more. All these for the purpose of enhancing your website’s functionality as well as its usability. This beautiful church website template comes with a gorgeous and feminine design aesthetic that works well with religious websites looking for a clean and fresh style. Although it has a delicate appearance, Salvation is loaded with powerful features which enhances its usability and functionality. Made with WordPress, you can expect lots of options included in the theme. Its collection of state-of-the-art features, such as the event management system, a donation form, drag-and-drop homepage builder, fluid responsive layout, and custom widgets; the theme can also be used for various organizations like non-government organizations, charities, and so on. Speed optimized and SEO-ready, this template is a highly recommended choice. City Church is a simple but functional church website template made with the popular WordPress platform to bring your church’s online web portal to life. It has a “reclaimed wood” style which provides your website a beautiful vintage aesthetic, along with subtle animations and parallax effect integrated into this template in order to boost its visual appeal. This theme comes with a bundle of different features and options, as well as various essential pages and valuable elements. Among these are dedicated pages for Sermons, Recurring Events, Staff Pages, and more. It also includes a working Contact Form and an Event Manager, with a Series, Speaker, Verse, and Topic sorting capabilities among many others. 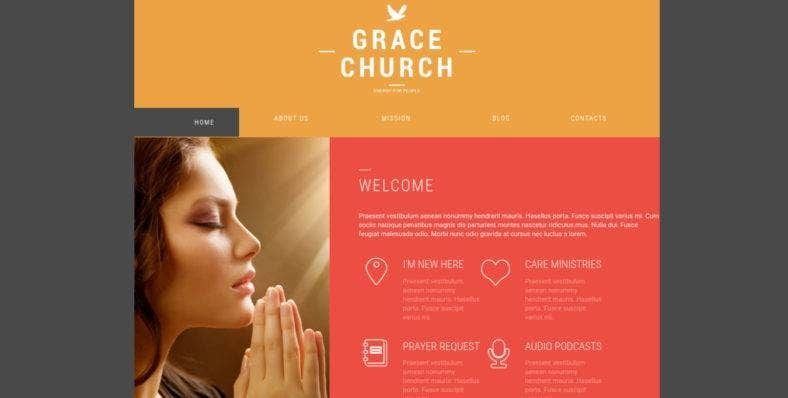 A sleek and modern WordPress template with a fully responsive grid-based website layout, Grace Church is built exclusively for religious-related organizations to set up an online presence. Well-structured and organized with a unique design and warm undertone, you will surely catch the eye of potential visitors and increase your web traffic. This theme is developed with rich content and full features in mind, that is why it is built with different sections to display various post which makes it easy to read as well as navigate. The different colors incorporated in each section are also an intuitive way to create a seamless visual division among contents. Your website will surely stand out from the rest. SKT Church is a religious WordPress theme made for churches and its members and followers. Along with the other church website templates in this list, this template is a great tool to gather people from around the world who share the same faith. With an internet portal like their orn website, they are updated with the latest happenings and can make donations easily. No matter the purpose of your church website, this theme includes as much functionality and flexibility you need. You can use this theme to build online listings for churches and worship centers, share Gospel music and Sermons with its own audio player, and many other unique uses. It also has sections for info boxes, message boxes, news, image gallery, and contact form. Last but definitely not the least, is this classic yet stylish WordPress template that is also versatile and functional as it features tons of options and attributes. 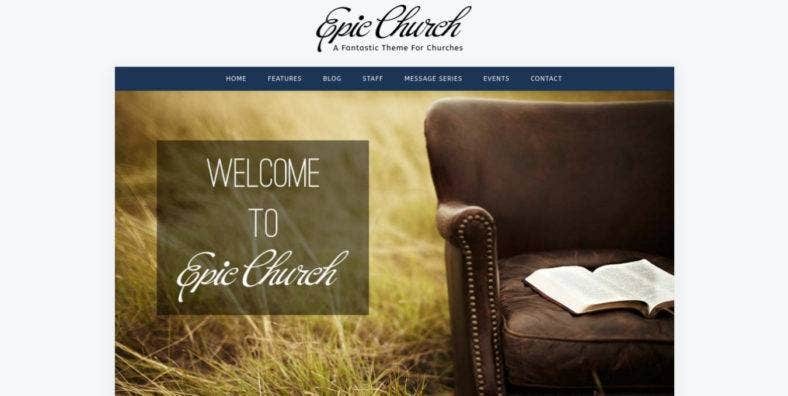 Epic Church is created with both standard and unique features to meet the needs of today’s churches as well as to provide an outstanding visual image that reflects the mission and vision of many religious organizations. The theme sports an engaging design with its responsive and retina-ready layout, robust podcasting and media support to provide different media outputs for members to consume, a customizable design that lets you modify the look and style to fit your taste, and other useful tools that could enhance your website’s usability and functionality. Nowadays, in order for churches and other religious institutions not to get left behind, they need an effective and efficient medium to spread their causes and messages to as many people as they can. And nothing does it better with a well-designed website where people can access your services and other important information easily online. Therefore, we guarantee that the WordPress theme and templates listed on this article live up to these expectations with powerful features and state-of-the-art designs. So, make sure you grab this opportunity and download the template you think is best for your religious and church websites.